Mountain gorillas are among the most spectacular animals on the planet and Uganda is one of the best places to track them. Called by Sir Winston Churchill “The Pearl of Africa”, Uganda is just that, with magnificent scenery, a plethora of wildlife, and the friendliest of people. If you think that typical African countryside does not offer you endless rolling green hills, snow-capped mountains, misty forests and deep, crystal clear lakes, then you haven’t been to Uganda! Even though Uganda is a small country, it also offers white water rafting, exceptional game viewing, birding and some fantastic hiking. It is here that the eastern savannah meets the west African jungle. In a nutshell, there is no other African destination that offers such a diverse variety of activities and wildlife encounters. Yet with so much on offer, it is to Uganda’s Bwindi Impenetrable National Park to spend a memorable one hour in the company of a family of great Apes, that I am drawn. So what, you might ask, is so special about this once-in-a-lifetime encounter? Well, if you are a wildlife enthusiast and as passionate about Africa’s wildlife as I am, then coming face to face with a family of great Apes is one of those wildlife encounters not to be missed. For one hour you become part of their world as they go about their daily routine of foraging, burping, farting, scratching, playing, climbing or enjoying a siesta! It’s an experience that touches the soul and leaves one grasping for more. 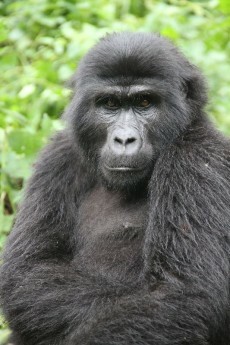 Today Mountain Gorillas are critically endangered and are found only in a very small region of east Africa. Living at very high altitudes and with strong family bonds, Mountain Gorillas do not survive out of their specific rain-forest habitat and familial groupings. So viewing them is on their terms, in their habitat, and requires you to journey to this remote part of the world. Mountain Gorillas have adapted to the high altitudes in which they live and their long glossy coats help to keep them warm and dry in the chilly forests. Each Gorilla has its own distinct facial features (after which it is named), habits and personality, all of which can be seen whilst sitting quietly and observing them. 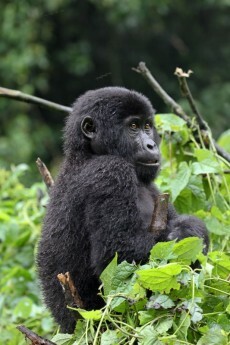 On average, Gorillas eat over 600 different types of plants, many of which are also unique to Bwindi. Their diet is made up of 90% vegetarian food and 10% ants, termites, bark and sand. A silverback will eat up to 20 kgs of food per day including the roots, flowers, fruits, stems, leaves and pith of a plant. A Gorilla band will vary in size, but is always controlled by the dominant silverback. His family breakdown includes adult females, black-backs, sub-adults, juveniles and infants. A female gives birth every four years and one female will have up to 10 babies in her lifetime, of which 6 or 7 will survive. Gorilla tracking follows a pretty standard routine. Daily, at 8 am, visitors assemble at the Park Headquarters at four locations around the Park for their once-in-a-lifetime encounter. The day begins with a briefing of the park and gorilla etiquette by the head ranger. This is followed by a maximum of eight people joining their pre-booked gorilla group for the day. Depending on where your given gorilla group is located, it can take anything from 20 minutes to 6 hours of walking to locate them. Accompanied by your knowledgeable guide and two armed escorts (to protect you from dangerous poachers and other insurgents), the walks take you through some of the most beautiful terraced farmland, rugged terrain and pristine forests imaginable. The majority of the guides who lead you on the trek are from the local villages and have been instrumental in the habituation of the gorillas. The local guides contribute to the overall tracking experience – just watching them as they communicate with the Gorillas, and listening as they share their stories from long-lasting memories, are worth their weight in gold. Weather is unpredictable in the rainforest and one can expect to experience all four seasons in one day. It is therefore advisable to be well prepared, fairly fit, and well kitted out in case the trek becomes strenuous. Bwindi is the only true rainforest where all three apes exist together – Mountain Gorillas, chimpanzees and man! One would say that after being on 4 safaris already, what else is there new to see, right? Wrong! Every time I go, it is another experience, and the last time at Timbavati was amazing! It is still the wildlife you see every time, of course, but what is very important is to have it organized carefully … you need to be at the right place at the right time! What is the use of finding wildlife if it is too far away or somewhere where the ranger is not allowed to go? Our trip was planned so that we could have the privilege of spending an hour in the company of mountain gorillas – an indescribable, life-changing experience. Without Lisa’s help arranging our visit to the KATE orphanage to give blankets to the wonderful children, we would have missed out on making a special connection with Hannington. Lisa also used her extensive experience and contacts in Uganda, specifically Bwindi, to arrange for a wonderful driver/guide Steffi and Fred to be our porter on our treks. Our accommodations and the warm and welcoming staff at Buhoma Lodge were outstanding. Thank you Lisa for all you did to make this an amazing and memorable journey to BEAUTIFUL UGANDA.